Topics related to the wedding of the Duke and Duchess of Cambridge can be found in the royal wedding subforum. Hey Zonk, they have 2 coats of arms. Can you enlighten this Yank as to why? Russo surmises that William belongs to one of them and he and Catherine are the second. Am I close? Thanks! Almost correct Russo - William's coat of arms is the one on the left, with the Garter belt wrapped around the shield. 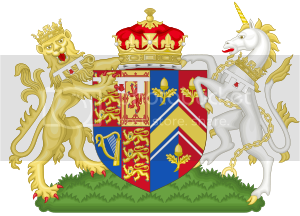 Catherine's coat of arms is the one on the right, which has a shield comprising of William's CoA on the left and her CoA on the right. 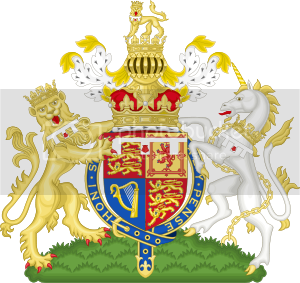 A combined CoA is customary for a female who has married into a royal family - a merge with her husband. I know some people don't like the design, but I still think Catherine's CoA is one of the nicer designs for a Royal Bride joining the Windsor clan. I think it's the colours and how well they go together. I was having problems accessing TRF last and this week, so have only now learned of William's part in the rescue of those sailors. Congrats to him and the rest of his crew/fellow Officers on getting those men to safety and home. Meanwhile Prince Charles and Camilla are hoping William and Kate will see in 2012 with them at Birkhall in Scotland. It will depend on whether William has to work over New Year but Charles and Camilla love having them to stay and hope they will be able to make it,’ says a source. Last year Camilla had to cancel her New Year with Prince Charles when her daughter Laura gave birth to twins Louis and Gus on New Year’s Eve. I agree. I think that fact that it is plain makes it blend very nicely when combined with Williams. I like it a lot. I think its great that Pippa has been invited for Christmas. It would probably be very comforting for Catherine. I was kind of wondering about how the holidays would go now that Catherine is part of the BRF. What about her mom and dad? Wont they be invited as well? So tomorrow is the concert by Gary Barlow in aid of the Princes Trust as well The Foundation of Prince William and Prince Harry and now even though not in name The Duchess of Cambridge. So William Catherine,Charles and Camilla will be in attendance. I'll be awake so I'll tweet any info I manage to get. So tomorrow is the concert by Gary Barlow in aid of the Princes Trust as well The Foundation of Prince William and Prince Harry and now even though not in name The Duchess of Cambridge. So William Harry Catherine,Charles and Camilla will be in attendance. I'll be awake so I'll tweet any info I manage to get. I'm looking forward to seeing your updates. You keeps us all in the loop. Thank you so much . We're all outside the Royal Albert Hall, where William, Kate, Charles and Camilla are due shortly. Laura Lopes and Sara Parker Bowles too. Please note that posts regarding William and Catherine's attendance at Royal Albert Hall for the Prince's Trust should be made http://www.theroyalforums.com/forums...a-31428-7.html . Although it is William and Kate’s first Christmas together as a married couple, St James’s Palace said today that the couple did not want to make their first joint card public. so, we don't will see the first christmas card of william and kate? this is confirmed??? Yes, their spokesman from St James's Palace said that William and Harry have never sent out Christmas cards and don't intend to start. So no official Christmas card from William and Kate. oh so saddddd, I really want to see the firt christmas card from cambridge cuople, and in the future the cambidge family. william and harry's last christmas card was in 2005, it's correct? So what is the reason for not wanting to send out cards with his new wife? I would think he would know that the people would love to see that. Their own Christmas card as the Cambridges, wouldnt that be nice. So what is the reason for not wanting to send out cards with his new wife? St James' Palace said that the Wales' had never sent out cards and were not about to start. Hmmm. I thought there was maybe some important reason. The fact that they never have doesnt mean William wouldnt want to. Well maybe he will change his mind, maybe not. It would be nice to see. Well if he wanted to, surely he would have. It isn't just William who would be in the Christmas card, guessing as he's married it would be a joint decision between him and Catherine. With a statement released from a royal palace regarding a card I don't see him going back on it. It would make St James' look foolish.